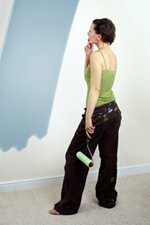 Interior paints can be healthty (or unhealthy) in several ways. 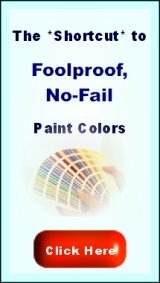 Of course, the more chemical the paint, the more toxic. Scroll down for more on that. But there's more. When a child is born, its organs are still very premature. The bowels mature by digesting the mother's milk. And the brain matures by receiving sensory perceptions! A baby has no consciousness of what it sees or hears - it goes right under the skin. A baby processes its sensory perceptions, by growing neural nodes. Its brain is actually formed by sensory perceptions. Some colors have a proven beneficial effect on newborns. A sky blue can help prevent rachitis, a bone-deforming disease. City-children used to get this disease by a lack of being outdoors (blue sky) - and it's treated with a blue lamp. Paint a sky-blue ceiling, and you'll have blue light too. Skin colors suggest the presence of the mother. And some people say, that for very young babies the psychological effect of color is reversed: green is to them a strong color, while magenta sooths them. If you use green, take a toned-down green (add magenta to it), just to be sure. You could apply a skin- or a soft magenta color in the bedding or the cradle-curtain. Balanced colors are an asset. Consider you child as a little ET from outer space, it's just getting to know earth and nature. 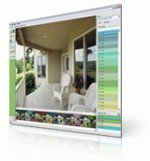 Natural room colors can be a great contribution to that. Think up a lasting design - that your child will still like when it's 5 or 7 years old. Also have a good chair for yourself, to spend time feeding your baby (at nights). Non-toxic paints are also a good when you're pregnant and painting. 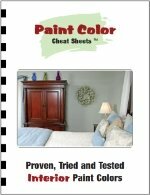 Milk paint is a good option for wood, for the walls you can take milk-paint, caseine paint or egg tempera paint. You can make them yourself. 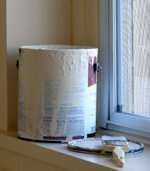 Latex is a reasonable option, but there's no latex in latex paint (it's all acrylic), and it will keep emitting small amounts of gas. If your woodwork was done with oil-based paints, consider buying organic oil-based paints. The worst thing of oil-based paints is the solvents you use for cleaning, but there are good alternatives for that (citric agents like Zest-it). The oil paint itself is not that toxic at all. Acrylic house paints however keep exhuming funny gases, even long after they dried. Paper wallpaper is a fine basis for painting with egg-tempera or caseine paint. Vinyl wallpaper might be more difficult, and the structure also will play a role. Click here for more on painting over wallpaper. Right now, all you think of is your baby. But think ahead: within five years, you'll have a five-year old with a mind of it's own. Removable decorations like removable wallpaper, wall stickers, or a good poster or canvas painting might be a good idea. When your child gets to the age of four or five, it might not like the bunnies or teddybears anymore, and it would be a shame if you had to paint the whole room again. Pinks are usually good for girls untill the age of 8 (universally, most little girls adore pink). When you think even more ahead, you might give the room some colors on which (in due time) you can paint your child's favorite scenery: a castle, blue sky with clouds and a rainbow, a fairy tale forest with a little house in it. Or a nightly scene, with stars or a house on fire (to play firefighter). 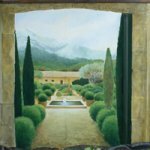 For all of these examples, realistic painting techniques, yellow ochre is a good underpainting color. That's about the same color as lightwood. For decorations, don't only look in the kids' department. 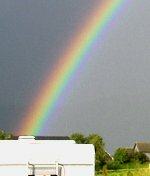 Trees, flowers, clouds and rainbows are fine for decorating a nursery - and not bound to an age. Short of ideas? Look at some websites for kids' furniture, buy something and pick the colors based on that. A painting or a rug is good for that too. 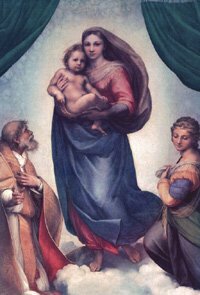 As a decoration poster, think of Rapahel's madonna with child (on the top of this page). The quickest way of making an overall design: pick a beautiful wall sticker, and pick colors from it for the walls and the bedding. If you can draw just a bit: take a color that's just a shade darker than the wall color itself, and paint the shadows of trees, windows, birds, or yourself. As long as your child is under the age of 1, you'll be the only one to know the difference. But it might be good to think ahead. Some faux painting might add to a lot of fun playing knights, or fireman. A boy's bedroom can be great for playing knights, fireman or space invaders. Girls might love a castle too. Or a pirate's ship. You don't have to paint all of that now - think of the colors you pick, as the basic colors for such a project. And of course, a sky can be green or even pink. 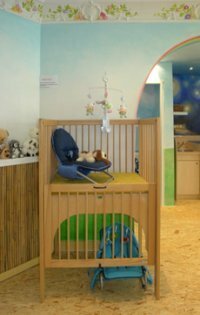 Put your bedroom and the nursery close together - children often have needs to be attended to during the night. Have a good chair for yourself, to feed your child, in the nursery. It will help your child getting accustomed to its own room, and your eventual partner can sleep while you feed. Have a door- or windchime that is harmoniously tuned. Tonal scales are pure math! There's a known connection between music and a talent for math. Music of J.S. Bach is good too, for that. Do you know these turnaround lamps? The lamp heat makes a fan - with decorations - go round and round. The moving decorations is projected on the wall like a movie. The repetition is great for kids who can't sleep. If that's too much: dluorescent stickers (a moon and stars...) on the ceiling give your child some orientation while it's going to sleep.